My interest in native plants probably arose like it did for many of the VNPS readers. I fell in love with what I found out in the wild places; state parks and national forests and the scraps of nature on the edges of farms and developments. I was fascinated by the presence of those native plants that thrive on their own and are the supporting elements of all wildlife. Why can’t we have more of this everywhere? Why are our homes, schools, and shopping places so bare? Why is there so much lawn? Of course, the story became more complicated as I began to understand greater land use patterns, diminishing habitat diversity, and the huge presence of invasive plants. However, those images of natural wildness guide me to this day. After studying landscape architecture at the University of Georgia, which gave a fair introduction to ecological design and native plants, I still had the notion of a one-to-one replacement for native plants in gardens and didn’t understand the subtlety of what “native” meant. It was a good start, but I had a lot to learn. I began in a Savannah, Georgia firm which was one of the earliest and only firms in the region suggesting plants like long leaf pine (Pinus palustris) and native coastland grasses where Asian azaleas and the beloved southern camellias were the norm. 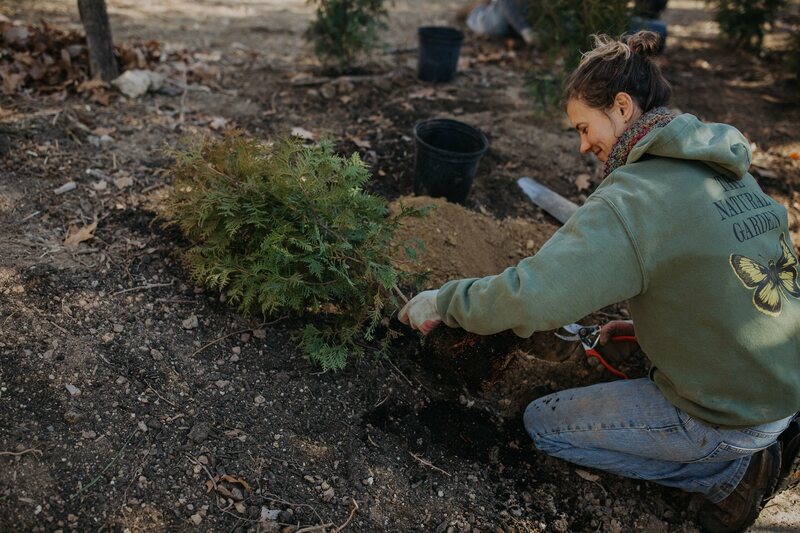 After designing for coastal projects, I worked with a habitat restoration company in Atlanta. Far from a glamorous affair, restoration involved chainsaws, herbicides, and collecting Indiangrass (Sorghastrum nutans) seed for many days, leaving me itching from head to toe. I learned the difference between pure restoration and native plant gardens- and where the two might blend. I came to The Natural Garden with some good experience, eager to learn the approaches of a design-build firm and to work more closely in the field and on the ground. Though we do meadow and other restoration projects, I want to share our approach to using native plants in garden design. When we design, we are mediating a conversation between the project site, how plants will grow and interact with the site over time, and the desire for human expression through place. We are often called to a project by clients who want to see something different from the sterile suburban landscape they see out their window. Others need help planning and want to incorporate pollinator plants. But like all arenas of design, the way we want to shape our gardens comes from the experiences we seek- a cloister for solitude and reflection, a stroll on a buzzing summer afternoon, a gathering spot for meals under dappled shade. We manipulate soil and plants, stone and gravel to create a place that is both alive and useful. When we design using native plants, we also extend that use and meaning to the non-human life around us. I often begin a design by stepping back and envisioning what landscape a building would emerge from were it in a natural area. Is it a meadow, a clearing within a shrubland, or a sunny opening in a woodland? Like any good gardener we observe like scientists. We note sun exposure and moisture levels, soil pH and texture, and the existing plants, overhangs, grades, and pavements. This begins to reveal a set of conditions and a list of plant species that will thrive. We often reference a native plant community; this reference landscape might be a shale barren or a mesic woodland, for example. What I find attractive about using native plants in design is that it removes one layer of artifice and reconnects the garden with the wider landscape. 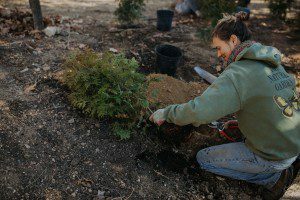 Lawn to Raingarden – A muddy backyard lawn area becomes a functioning raingarden with framing boulders and lush native plantings that support insects and birds. We sometimes find highly disturbed sites that don’t resemble anything close to the native landscape. The grade has been reshaped and compacted by construction, fescue and lawns dominate, water flows are obstructed by pavement, and invasives such as ivy and wiregrass prevail. In these cases, we consider our tools for intervention; deep tilling, removing weeds, or adding compost for soil nutrition. Then we put the plants to work; stabilizing soil, slowing water, adding organic matter, breaking up the earth, supporting innumerable bacteria, fungi, and invertebrates in the soil, feeding and housing birds and pollinators and smaller vertebrates, and finally, adding beauty to our daily lives. We choose species that interact well and complement each other structurally and visually. For example, Carex species stabilize soil as a groundcover and are host to many butterfly species, while Asclepias has a deep taproot and also provides nectar. Unlike restoration projects, we are designing for people in a built environment. These places often symbolize our hopes and memories and are meaningful forms of expression. A client will have dreamed, saved, and planned for their garden. People who seek us out often have the ability to see beyond the typical landscaping patterns. While we all understand the value of native plants, certain expectations still remain around how a garden should look and function. Sometimes, concerns about how neighbors and the larger community will come to see their landscape influence a design. Our job as designers is to provide a framework for the variety of grasses and perennials that are more ‘wild’ in their nature that balances what people have come to recognize as beautiful. 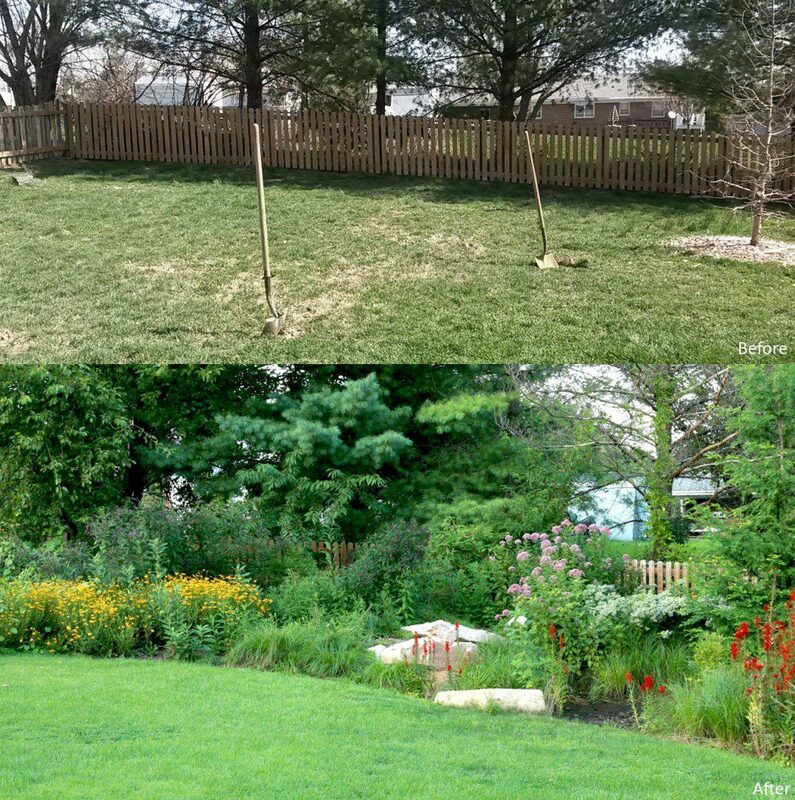 A few years ago we transformed a front yard into a stylized meadow garden with native grasses and wildflowers. We veered away from any lawn use or the typical foundation plantings. The garden has elicited strong reactions from neighbors and passersby. Some people love it and purposefully drive by to see what’s blooming, while others have expressed their strong distaste for the final result. While this garden may not fit most expectations for a typical suburban garden, in the end, our measures of success included providing pollinator habitat, increasing water infiltration, and the satisfaction of our clients! The front yard meadow garden in fall: Aromatic asters (Symphyotrichum oblongifolium) put on a show while other perennials go to seed. More habitat, less lawn. The typical existing urban and suburban environment often has an abundance of lawn, foundational plantings of evergreens, and is devoid of an herbaceous ground layer. Usually minimal thought has been given to circulation, privacy, or creating spaces. These are highly managed landscapes with very limited diversity. In contrast, native gardens re-establish an herbaceous layer. Rather than thinking of plantings as islands or beds to be filled, the paradigm is turned on its head. We consider stone patios as clearings within plantings, and lawns as openings or paths through the herbaceous layer. To create the framework, we set structure and formality using stonework, intentional planting patterns, and clean sweeping bedlines. Plantings can loosen and become informal farther from structures and at the fringes of properties. When we work outside of the traditional plant palette, the welcome constraint of natives requires the gardener to reimagine beauty and allow for a fresh creativity. For example, without daffodil bulbs and forsythia, the show of color we have come to expect in the early spring garden is not present. Though spring ephemerals like trout lily and bloodroot can grace woodland gardens, these are not readily available in nurseries or not appropriate for many locations. In March, the native landscape still is dormant. It unfurls at a different pace, and we must learn to look more closely in order to appreciate the subtle beauty of the Red Maple (Acer rubrum) blossoms, the catkins of the American Hazelhut (Corylus americana), or the saturated colors of the native stone after a rain. We can enjoy the seed heads and winter structure of grasses, the subtle branching patterns and buds of shrubs and trees in their sleep. 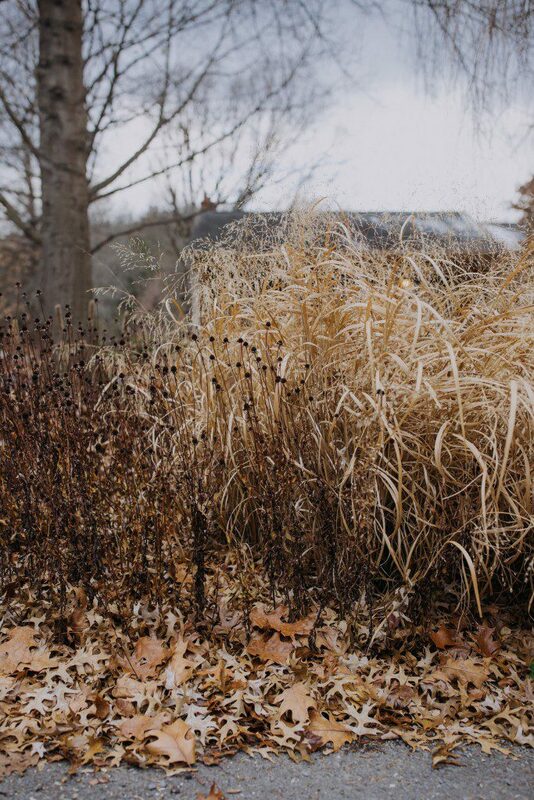 Native plants can provide winter interest through texture: Orange coneflower (Rudbeckia fulgida) and switchgrass (Panicum virgatum) with oak leaves. Plants in the native garden are more than pretty specimens. They serve an ecological function. In a native garden, beauty is found in the life that it attracts, and in the interplay of the plants. We can watch how a wildflower ‘moves’ spontaneously around the garden year after year. Of course, we can guide the garden and nudge it in the right direction, yet the garden changes so dramatically throughout a season and over the years, that we must allow and embrace the evolution of a garden that is not static, but alive. I am proud to be a part of The Natural Garden, an advocate in our community for native plants. Supported by our clients, we are reimagining the concept of what a garden should be to incorporate the needs of birds and pollinators, the flow of water, and the resiliency of plant communities. We hope to create places that reconnect us to the changing of the seasons and tie us to the land. We incorporate boulders and stone paving to remind us of the wildness that exists in the mountains and hills of the Shenandoah Valley and beyond. We want to inspire spaces that are not only meant to be looked at, but lived in. 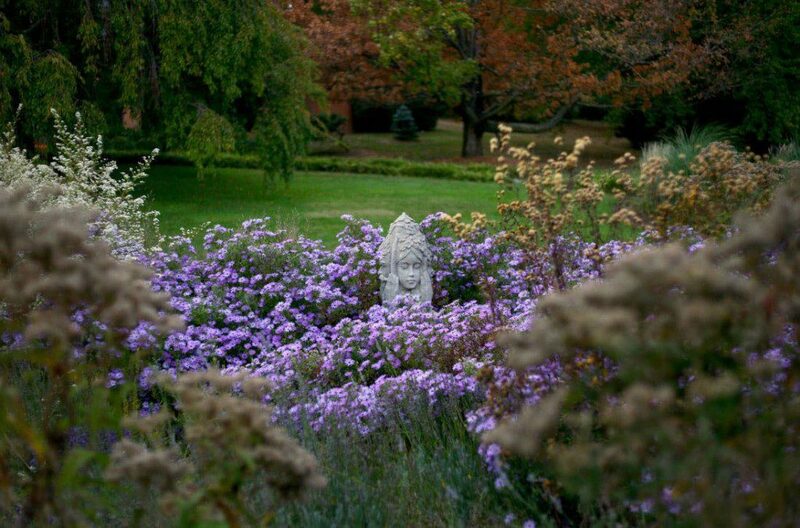 Along with scientists, writers, artists, nurseries, naturalists, gardeners, and plant enthusiasts we are reweaving the fabric of our landscape, pulling together the threads of culture, gardens, and the native landscape. The author, Agustina Hine, at work! A fascinating read! Well done!